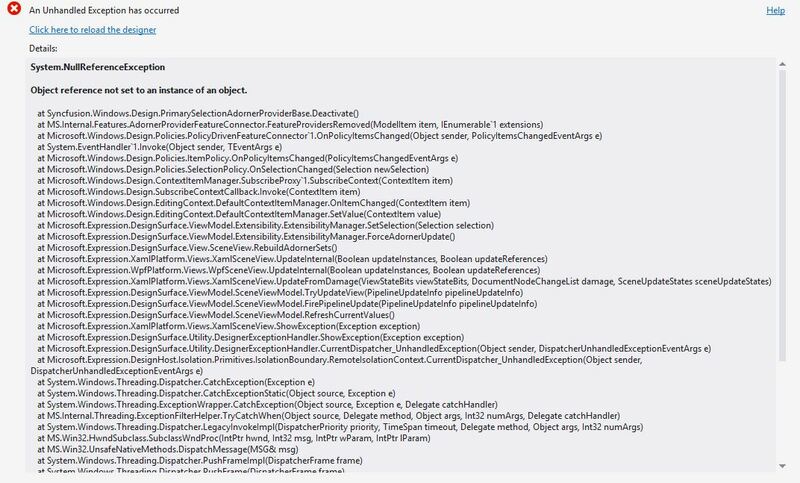 I get an error whenever I click on any part of the DoubleTextBox XAML code. The code can build fine, but I would like to know the cause of this error. I don't encounter this issue when I use the IntegerTextBox. I have exactly the same error when playing with the WPF sample. When I click to another line, I can see my design view again with the double text box. I don't get any build errors and it runs and functions fine. But I really would like to get down to the root of the problem, and would appreciate any help you could shed on the matter. It seems I have all the references I'd need, since it does work..
We actually couldn’t reproduce the Designer Crash issue in our side , If you could provide more information such as version of Syncfusion Essential Studio you are using and the version of framework, we can dig deep into this and can help you at earliest. I'm running Essential Studio Version 13.1.0.21, Windows 8.1, Visual Studio Community 2013. I figured out the issue after some further digging -- I have a VS extension called XAML Regions (created by Jacob Johnston) installed. After disabling it, the DoubleTextBox works fine. Just thought I'd post this in case anyone else encounters this issue in the future. Sorry for double-posting, but just wanted to mention that strangely enough, after disabling and re-enabling the XAML Regions extension, everything seems to be working fine. No issues whatsoever anymore.